The celebratory year to mark 50 years of the queen’s reign started on a sad note, with the death of Princess Margaret in February and the death of the Queen Mother in March. Some predicted the occasion would be more subdued, or that crowd turnout would be low – but all were proven wrong. The year included thousands of miles of travel for Her Majesty and the Duke of Edinburgh, with trips to Australia, New Zealand, Jamaica, and Canada in addition to a tour of the United Kingdom. The run up to the main June celebrations included a dinner hosted at Downing Street by Tony Blair for the queen and her surviving prime ministers, a speech delivered to both houses of Parliament at Westminster Hall, and a Portsmouth parade of armed forces personnel among other events. 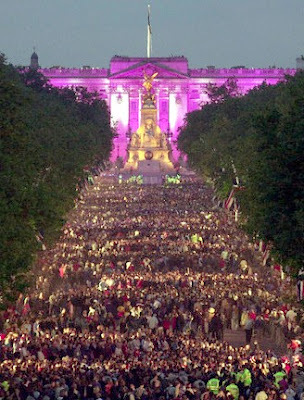 The big jubilee weekend was held from June 1 to June 4, and included 2 concerts at Buckingham Palace: the Prom at the Palace, for classical music, and the Party at the Palace, for pop music. The Party at the Palace is memorable on several levels: it opened with guitarist Brian May from the band Queen playing God Save the Queen from the roof of the palace, and Camilla Parker-Bowles occupied a prominent seat a few rows behind her future husband Charles to list two examples. A National Service of Thanksgiving was held at St. Paul’s Cathedral on June 4th. Queen Elizabeth and the Duke of Edinburgh rode in style in the Gold State Coach, with members of the royal family in other carriages. Following the service, lunch was held at the Guildhall. Next up was the jubilee parade and the traditional appearance on the Buckingham Palace balcony, made extra festive by a giant covering filled with Commonwealth symbols. On the balcony. 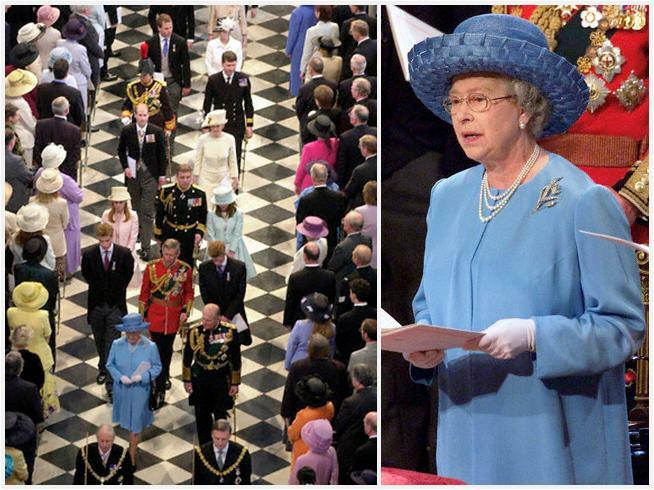 Note how all the ladies wore pale colors, allowing the queen to stand out. 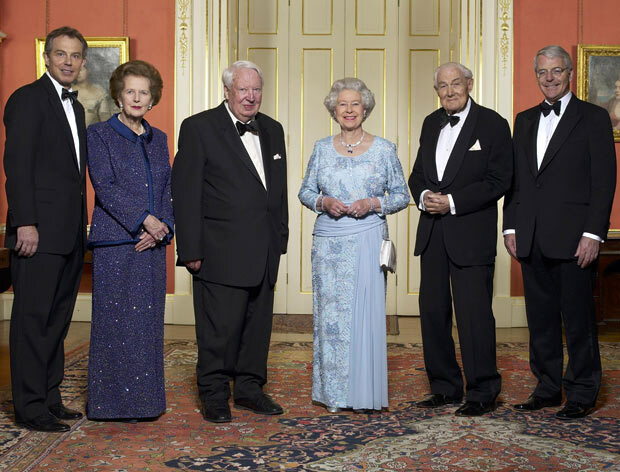 Later in June, Queen Elizabeth hosted a private banquet for Europe’s reigning monarchs. The dinner was timed to allow those sovereigns that are also members of the Order of the Garter to participate in the annual Garter service, an unusual sight indeed (foreign monarchs are Stranger Knights and Ladies, and don’t generally partake in Garter Day). Garter Day leads into the beginning of Royal Ascot, so the fellow royals were able to stay and enjoy some racing before they headed home. Sovereigns at dinner and on Garter parade. Formal photo, back row L to R: King Albert of the Belgians, King Juan Carlos of Spain, King Harald of Norway, King Carl Gustaf of Sweden, Grand Duke Henri of Luxembourg. Front row, L to R: Queen Margrethe of Denmark, Queen Elizabeth, Queen Beatrix of the Netherlands. The abdicated Grand Duke Jean of Luxembourg and consorts were also present. For the Diamond Jubilee, the royal couple has left the world traveling to their family while they have been making their way around the U.K. We’ve seen several tours so far; tours still to come include the largest Commonwealth countries for the Prince of Wales and Duchess of Cornwall and a trip in the fall for the Duke and Duchess of Cambridge. 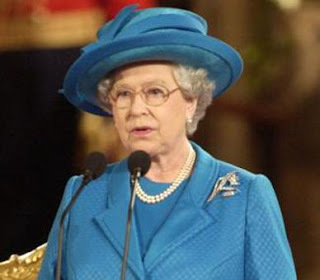 This year, the queen is expanding from just inviting European sovereigns and has invited the world’s sovereigns to lunch at Windsor Castle on May 18th. Prince Charles will host a champagne dinner the same night, and other members of the British royal family will be in attendance as well. The big jubilee weekend will kick off on June 2nd with the Epsom Derby. The next day will see one of the most interesting celebrations this year: the Thames Diamond Jubilee Pageant, including 1,000 boats and Her Majesty floating in her very own specially designed Royal Barge. On June 4th the BBC will broadcast a concert from Buckingham Palace. On June 5th there will be a Thanksgiving Service at St. Paul’s, which will be followed by a ride in open carriages (seems no Gold State Coach this year, sadly), receptions, lunch, and a Buckingham balcony appearance. All of this plus beacons, street parties....and loads of fashion for us to gaze at.